First off, the charts were updated with the sales of I'm Letting You Go. If you didn't hear, Steps came in at number 2 behind Enrique who is STILL holding the number one spot. BUT, rumour has it that Steps sold around 35,000 copies while Enrique held the number one spot with just over 500 copies more than Steps! S Club 7 comes in at number 3 with way less sold than Steps with 27,000 sold. To boost sales for this week and hopfully reach number 1 next week, Steps will be at Virgin in London on Thursday to sign copies of the single. If things go planned, this will be the first time in Steps history that they jump from number 2 to number 1 in consecutive weeks. Baby Don't Dance also hit the Canadian charts at number 14. Also, don't forget that Gold: The Tour is released on video and DVD Tuesday! Virgin and around 4 other top music chains in London metro are offering preorderings for the next album Step Two. They have been doing this for about one month and sales so far are a little over 12,000. So if you would like to preorder a copy or two for yourself, hop on down and get one. The manager at the Virgin store in London commented on what he thought sales would be for the new album, and he said, "Steps album always sell very well the first week but this is the last album and we have had many people coming in asking for the release date plus add that to our preorder sales, we are thinking we will be sold out the first week." The album is released next week. This weekend Steps will be in America on MTV doing the program MTV:First Listen for their upcoming album Step Two. They will be talking with a studio audience answering questions from them and Carson and they will be previewing tracks and talking about them while they play. The last First Listen done was for Britney's latest album. Tickets for the final date on the next tour have been deemed gems. Steps have prevented the sale of the tickets and have promised to send them out to radio stations, tv stations, newspapers and magazines and websites to conduct contests for fans to win. There are around 12,500 tickets out for grabs for the Wembly show. Make sure you keep your ears and eyes open for ways to get your hand on one of these tickets. The show is also going to be on Pay-Per-View and will be the final release of a Steps concert. The tickets will be released on the 6th of March, the same day the tour starts. Each winner will be given a special Steps farwell package of Steps' goodies including a certificate for a free copy of the concert when it is released on video. There will also be 30 grand prize winners who will recieve Backstage Passes to the exclusive afterparty. The contest will be open to everyone no matter of country residence but no transportation is provided. Thousands of pop fans will be hitting their record stores today to pick up the fresh new (and last) single of the phenomenon Steps. After a whirlwind of contraversy over the past months, Steps hit back with the latest installment of I'm Letting You Go, a fast paced, eigties-sounding track that is sure to top the charts. And not that contraversy ever hurt anyone, Steps look to climb the singles charts fast due to their recent publicity. Steps fans everywhere are sure to buy the new single for the sound and for memorablia, for after this one it's all coming to an end. Solo careers are planned for future singles and a huge world tour to wrap up the long and exciting career of the fivesome who set out five years ago to proove critics wrong. Even if you're not a Steps fan, you have admit, they sure deserve a final number one. Baby Don't Dance is also out in Canada today! So all you fans over there get out and buy buy buy! Tommorrow is the Brit Awards! Steps will be performing with 3SL and Allstars and be recieving a Lifetime Acheivement Award! Steps were on TOTP today perfroming their new single I'm Letting You Go. Hoepfully everyone caught that awesome performance. Tommorrow is the big day! Steps' new single I'm Letting You Go will be released in the UK! So make sure you go out and buy a copy so we can get them to number one! Also, Steps are currently rehearsing for their upcoming world tour. The tour starts in March and is going to be filled with cool stuff and great surprises. Tickest for the international dates of the tour go on sale Wednesday, the 20th of Febraury. So remember to get out there and buy your tickets. If you are in America, alot of the dates have already sold out. Dotmusic: What can we expect from this tour that is new for Steps to do? Faye: Well, each tour is a bit different than the last and we always try to outdo the previous tour. So you can expect tons of unexpected surprises and of course a great party. Claire: And since this is the final Steps tour, we hired some outstanding designers to blow our fans' minds this time round. D: Okay, can we get an example of something outrageous planned? H: HA! If we told you that kind of stuff you wouldn't have a reason to come now would you! But, let's just say that everyone in the audience will have a great seat. D: Alright, if you don't want to give us a sneek peak of surprises, let's move on. I hear the setlist is huge! Can you confirm? Lee: I would have to agree with you on that one! Lisa: Yes! We are totally outdoing ourselves this time! We are going to be exhausted. So far we have planned on 28 songs. We are also not having opening acts and there will be an intermission this time. So when you buy this concert ticket all you are getting is Steps. D: Wow, 28 songs! That has got to be tiring! All that live singing? I mean since your last tour was almost ALL live, you guys are going all out and all live this time right? Faye: Why yes indeed, of course! No other way right? In fact, we have been hearing for years that we were never a true act because where was the band. Well, we are totally set out the prove everyone wrong with this tour, so what better way than to have a live band right? D: There's a band this time? Claire: Is that what Faye said? (Laughs)Hmm...maybe, maybe not. You'll just have to show up and see. D: So, it's a world tour. Where are you guys going? Claire: Well, we are starting out here and then heading over to America to open for *NSYNC. We are also going to Canada, Australia, Asia and Europe. Faye: And even South Africa! I'm most excited about that one! D: So you guys finally head back to America, why now? Lee: Well, have you looked at the charts recently? Lisa: We have been doing very well over there with our current single and we felt it was about time to give the fans over there another Steps treat. D: So, off the subject of the tour, your single, it's doing well over there. Any reason you think why? H: Well, we went and publicized it which we have never really done before. Plus we catered this time to an audience that was a little older. We went on MTV and got our video on the big Toal Request Live and we are all over the radio now! D: Sounds great! So is there anything you would like to tell about the tour to wrap things up? Faye: This is the farewell to Steps the group tour, so this is your last opportunity to catch before we go our seperate ways. Lee: You're going to be shocked with what we have planned! Claire: Lots of songs, lots of sparks and lots of good laughs! Lisa: Solos are big and rehashing the past! D: Thanks guys! One last question, want to comment on the December events? H: It's Febraury,w e have moved on! Claire: Yes! Now you do too! Steps will be making their first TOTP's appearance this year on the 18th of February. They will be performing their new single I'm Letting You Go, which is also scheduled to release on the 19th of this month! So remember to check that out. And don't forget that Baby Don't Dance is released in Canada the same day. Baby Don't Dance continues to do extremely well in America on the charts and on tv charts. Sales for this week have been pretty steady with midweek sales being at 97,500 units this week. Poles have shown that the song is most popular in San Fransisco and Boston, with a second huge market in New York City. Although sales are good, Steps look unlikely to get the Gold rating this week. The song also hold steady at #3 on TRL just behind *NSYNC and BSB. More dates have also been confirmed for the upcoming tour. Check out the tour page for that info. Stelists have also been announced BUT not confirmed. We are following up on that. Also, the first set of UK tour dates have now gone on sale! The tour is rmoured to be 2 1/2 hours long and the average price of tickets is BP 30. Steps will be at the Virgin Megastore in London tommorrow to sign autographs and talk about the new and upcoming releases and talk about the STEPS AROUND THE WORLD TOUR. Make sure you check out the tour page for all the latest updates on all the venues across the world. Steps were on The Tonight Show last night performing their new hit Baby Don't Dance. Hopefully you caught that great LIVE performance. Steps move up the Billboard charts this week in the US selling over 250, 000 copies of their new single Baby Don't Dance. The sales reached 250,256 exactly Saturday night giving Steps their first silver status single in the US! Check out the charts for a full update on other positions. This is from Dotmusic today on the new album. They are not too positive but hey everyone likes different tastes in music and they never give Steps a wonderful review. Back in December thousands of anti-pop gurus were jumping for joy for the almighty Steps had called it quits. But, of course Steps were never known for following the cool crowd (I mean who could pull off matching clothes and plastic smiles but them) and quickly STOMPed out that rumour with a quick change of plans. Steps may have never been cool, but they hit a major nerve with the record buying massive. Sneer all you like, but it wasn't thin air or NME covers that kept 'Tragedy' in the charts for over six months. And so Steps are still here... surprised? Us too! But don't worry, we give them another year before it comes to an end. Hey, they even told us no more of them after 2002. But until then they have decided to grace us with yet another steptacular album (no pun intended.. yeah right). The fifth and final Steps album, Step Two attempts to bridge the gap between popgroup and solo careers that each member plans to take by the end of the year. In a sense, it's the best way to comfort fans of the end of one great aspect, and introduce a new aspect of the future. The maturity of the album is one notch up from their previous album Buzz, with a convienent amount of solo productions (for example Faye Tozer's two solo songs) while keeping with the Steps appeal with such group songs as the first single I'm Letting You Go. The album has been described by the band as a symbol of the past and a prediction of the future. Holding the best of both worlds, the album was rightly named Step Two (although this is their 5th album) to show the second part of the "journey" they are all undergoing in the music world, which is how the band put it in January in their press release. The music itself projects the feeling of independence for each bandmate while forging the needed alliance to keep the masses happy. And we all know if the 13 year olds are not happy, Steps will ultimately flop. Tracklisting: The first single off the album is always destined to be the first track, which is called I'm letting You Go. Steps think that the new trend is eighties funk but someone should tell them otherwise. I mean wasn't Chain Reaction enough? This album is full of songs only sung by one or two members including the repetitive and trite Bang! (a duet between Faye and Claire). And it wouldn't be a Steps album without a little help from Pete Watermann who continues to write bad music for them. Especially For You and the guitar filled melody male duet of Hey Baby is the last remaining attempts by Watermann to get his nose in on the action. But since this album is all about the solo careers that are in the near future (save us all) Steps have filled their fifth musical allusion with unsophisticated but happy solos. How Do I Deal is the first of two solos Faye has on the album and is the presumed direction for her furture solo career. Lisa has always been known for her excellent solo songs that she usually pens herself. And then she made the eighties Gibson xerox Fading. Last Night is a classic Claire solo- nice and smooth oh and SLOW. She needs to speed things up with the solos. Who would believe that the boys would save the album. H and Lee by far have had the worst run of luck in music creation but it would seem by the fifth album they finally start to get it. What You Own is a TOTAL revolution from what Lee has done in the past. The music is deep and complex and the lyrics are profound and meaningful and for once, H finally gets something right when it comes to writing music. Mixed Emotions fills the album with a club beated song- the only one. And of course let's end the album with a slow ballad that would blend perfectly into a West End musical. You Make Me Smile is the second solo for Ms. Faye and is co-written by Jasper, her fiance. And then there are the songs that just do not seem to have a place...they are not solos or duets nor are they the coined first single material. First we relive the mechanical stutterings of Here And Now with the Max Martin tune High. Then Steps feel the neccessity to put old songs on a new album. Bittersweet and Mars And Venus (We Fall In Love Again) are included to give you that feel for the past theyare so going for. To buy the album or not, that's up to you. But if you don't, you're likely to miss out on what is probably going to be one of the best selling albums of the year. With all the split publicity that Steps were probably intending on in the first place, Step Two is bound to sell wihtout much praise. People will get it just for the nostalgia of an ending pop era. Well it's about that time of the year again when all of Britian celebrates the wonders of music. And of course there is no better way to do this than to have an annual awards show. And usually Steps seem to miss out on all awards (except for that random "we-feel-bad-for-you" Best tour award a few years back) but things have seemed to change at this year's awards ceremony. Although Steps are not nominated (once again) for Best Pop Act or Group they are remoured to be recieving the alltime honour of the Lifetime Achievement Award! ALSO, like it couldn't get better, Steps will performing this year! There is rumoured to be a grande singing popaganza with Steps, 3SL and AllStars. So make sure you check the show out if you live in the UK. Also, pop over to the official Brit Award site and vote for your choices in each of the categories. Just click on the logo to the left and get busy clicking! Steps are on US MTV from 9 to 4 today presenting Saturday morning videos and showcasing some of their favourite videos from different artists and even their own. There is no performance on this show, they just sit around on couchs and beds real lazy-like and talk about anythign that comes ot mind. This is the same show that Christina Aguilera got herself in trouble with when she made a few comments about Eminem. Today, Steps were the guest artists on the Rosie O'Donnel Show! They perfromed their hit single Baby Don't Dance and did a VERY short interview section with Rosie. She also publicized the new single and talk a bit about the release fo the new album next month. Keep watch for the other TV events that will showcase Steps in the US over the next couple of days. As we said yesterday, the final stop of the next tour will be at Wembley and you must win tickets to that show. The show is also going to be on Pay-Per-View and will be the final release of a Steps concert. The contest will start the 6th of March, the same day the tour starts. There will be 12,500 winners and each winner will be given a special Steps farwell package of Steps' goodies including a certificate for a free copy of the concert when it is released on video. There will also be 30 grand prize winners who will recieve Backstage Passes to the exclusive afterparty. The contest will be open to everyone no matter of country residence but no transportation is provided. Canada has now been added to the list of countries that will be recieving the international release of STEP TWO. BUT, surprise, surprise, they will be getting a different single! Baby Don't Dance will be their first single and will be released there the 19th of February. We just found this info out. So far we THINK it's the same cover as the US release but we don't know. We will figure it out for you as soon as possible. Ananova reported that Pressplay has signed a deal to ensure such artists as Britney Spears, Steps, N'Sync and the Backstreet Boys feature on its web music service. The agreement with Zomba music means all artists on the Jive, Silvertone and Verity labels will be added to its library. Pressplay is a joint venture between Sony Music Entertainment and Universal Music Group. Along with rival MusicNet, it constitutes mainstream music's attempt to repeat the success of Napster while generating revenue for the industry. Users are invited to listen to tracks streamed over the web, or downloaded onto their desktops, for a monthly fee. Pressplay chief executive Andy Schuon described the deal as an important step towards including "the vast majority of the world's popular music" in the service. Steps have been confirmed as performers on Saturday Night Live (SNL) on the 23rd of March. As you may or may not know, SNL is a huge comedy live show in the US where top artists are showcased each week and preform two songs during the show. This does take the place of one of their Canada tour dates. We were also told that the South African tour date was concelled due to booking problems with the proposed arena. Steps were also looking at ways to cut back on dates to end the tour early and this was a good excuse. They also ended up cutting the last week off the tour which was scheduled to be a week of UK dates. Now, they will end the tour a week early in London at Wembley Arena. This will be the second show at Wembley on this tour. Tickets for this show have been rescricted to a contest. Info on the contest have not been released yet. Onto chart and sales news- Baby Don't Dance is moving right up the charts, taking most of the big cities by storm. We are recieving lots of emails from people writing in to tell us they heard the song. It is now becoming a commonplace tune on most major pop radio stations. My local musicstore has been sold out for a week now and shipments are backordered. Last week sales were 210,510, which puts it about 35,000 shy of certified silver status. But with it's continued success it looks to reach GOLD by the end of the month. AND, just in case you did not notice, Steps have taken the #3 place today on TRL. These beats out O Town who not so long ago they were introducing this video. Way to go Steps! The video for I'm Letting You Go was released yesterday in the UK. For everyone over there, make sure you get voting on TheBox! It's the same video for Baby Don't Dance. Sunday was the premier of the US Billboard Charts for Baby Don't Dance. And considering Steps' past history of releases here in the US, I'd say they fared pretty well. 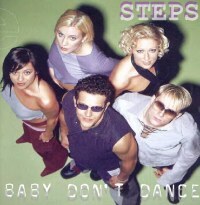 For the week beginning the 27th of January, Steps hit the Billboard Hot 100 Singles charts at number 22. This is calculated through single sales (30%) AND radio airplay (70%). So get them higher by requesting BDD on the radio. Steps also performed at Brown University this past Saturday and I was there to see the show! They performed 4 songs total and had an autograph session afterwards. There wasn't a too huge crowd since they are pretty unknown at the university. Songs performed were: Baby Don't Dance, Tragedy, One For Sorrow and Stomp. Speaking of appearances... this week is full of promotion for Steps here in the US. Make sure you tune in to all the places they will be spotted this week. Also, the tour news is coming in VERY slowly and as soon s we have all the dates we will get them posted. Finding out the international dates has seemed to be hardest part and we want to make sure it is correct. We are also working on finding out what the setlist is going to be like and if there any spoilers we can provide. We are also working on getting some international covers, tracklistings...etc. but as with everything else, it is coming slowly.Thank for your patience though!